This is the walkthrough for the first chapter of the LEGO Lord of the Rings Nintendo DS/3DS game. 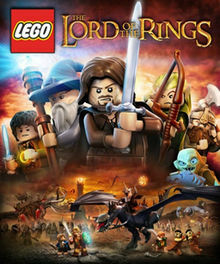 This walkthrough should apply to the LEGO Lord of the Rings games on PSP, iPhone and iPad, however there may be some discrepancies. So I’ve unboxed the game cartridge and put in my Nintendo DS and I have sat through the lengthy introduction which is all voiced (great no more reading the cut scenes)! Use the ‘Block’ control against the bowman’s arrows and then you’ll get a short cut scene. It wasn’t immediately obvious what I supposed to do after the cut scene so I had a look around and found the follow things to interact with. To the left hand side(LHS) of the screen you’ll see a ‘Mordor’ object (which can be destroyed by Sauron or by those who wield Narsil or Aúdril) in the cliff side over some lava, press, hold and release the Y button to destroy the ‘Mordor’ object and kill the enemy bowman. Now do the same to the ‘Mordor’ object to the right hand side(RHS) of the screen to kill the other enemy bowman. Once the enemy bowman have both been killed more enemies will come out, kill these like you did before. Once you’ve defeated them all, some more enemies will come out but this time they will have shields which means they can block your combat and make it more difficult to kill them. In order to kill the shielded enemies you’ll need to use the A button to push them off-balance and then press and hold the Y button to charge at them to break their shields and defeat them. Once you’ve defeated the shielded enemies, you’ll see a short cut scene of loads of enemies coming over the cliff, these also have shields so you’ll need to do the same again. Once you have defeated all of the shielded enemies you’ll watch a long story cut scene and move on to the next level. You’ll find yourself in a fiery cave, use the Y button to destroy silver rocks around the level for studs (these are used as money). Make your way to the RHS of the screen and wait for the grey platforms to fall down the lava, use the platform to jump over to the rock platform by pressing the B button to jump and the direction buttons to move over to the right. Repeat this action again from the central rock to the RHS platform using another grey platform which will fall from the lava. In front of you you’ll see a grey wall with studs up it, walk upto the wall and your character will start to climb the wall. At the top of the wall you’ll see a ‘Mordor’ object to the RHS, press, hold and release the Y button to destroy it and make a stepping stone bridge. Use the stepping stones to jump across to the other platform and kill the enemies on the other side. Press the Y button on the red and black sphere to break it up and gain some studs. Head up the ramp and jump over the lava gap, this is a bit tricky, using the Elrond character I walked along the edge and jumped up straight, if you collect the first couple of studs then you are in the right place to jump across. Press the Y button on the red and black sphere which will cause the gold bricks on the wall to move and some studs will appear. Switch to the other character and jump up next to the gold bricks, your character will hang off them and then you can use the B button to jump across them and collect the studs. On the RHS you’ll see a red and black flag, use the Y button to break up the flag and then press and hold the A button to build a bouncy board. Jump on the board and press and hold the B button to jump higher and land on the platform above. At the top press, hold and release the Y button to break down the ‘Mordor’ object. Switch back to the Elf character and jump up the walls using the B button (only Elf character have this ability), then to the RHS push the rock onto the volcano. Switch to your other character and jump on raised platform and then up again to platform above where your other character is. Press, hold and release the Y button on the ‘Mordor’ object to break down the wall and then use the golden bricks to collect the studs and get over to the other side of the cave. With your other character you can drop down and press the A button to pull the leaver to open up the gate and reveal some more studs. Jump over the gap and head up the stairs. At the top you’ll find 2 enemies, kill them both to get a key and attach it to the krank on the wall but watch out for the shielded enemy. Kill the enemy and use the A button to turn the krank and lift the gate and head through it to the next area. Head along the bridge being careful to not fall off the side and use the A button on the gold ring object in the middle of the platform. You’ll now watch a long story cut scene.